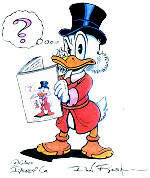 In co-operation with Don-McDuck.de we prepared a little interview session for the Fans of Don Rosa. Until April 30th, 2004 you had the chance to send us your questions for Don (the form mailer was unfortunately only available on the German version of DuckMania). In the last episode of your own comic Captain Kentucky your main character Lance Pertwillaby / Captain Kentucky obviously dies by getting smashed. Was this really meant to be the conclusion of the series? Or would there have ever been an installment of it (or a whole new series starring Lance), if you hadn’t started working for Disney? No, that was supposed to be the absolute end of that series. I was very frustrated that nobody in town seemed to be very interested in what I thought was a unique idea in all of America—a comedy-adventure comic strip featuring real local people and places! I still think it would have been a sensation in another city besides this one. After that I went back to doing new episodes of The Pertwillaby Papers which used the same Lance Pertwillaby character. And in the opening sequence I had Lance waking from sleep and saying that he’s just dreamed all of that Captain Kentucky stuff. So not only was I saying Captain Kentucky was finished, I was saying that it never even happened in the first place! Also: Please remember that I have never worked for Disney . All of these decades of wonderful Duck (and Mouse and etc.) comic stories have all been done by freelance writers and artists working for independent licensed publishers! Please don’t give Disney credit for any of that body of work! I’d been interested in the background of the onepager you have made for the German Tempo magazine, because it’s the only Disney comic you didn’t draw for a Disney licensee. Tempo magazine had been featuring one page strips by famous European cartoonists, and Egmont/Ehapa arranged for me to do one for them with the Ducks. The idea was that the strips (mine and the others) had to somehow feature the odd Tempo symbol that looked like a running or jumping man. I have no idea what was involved in Egmont allowing Tempo to print a Disney comics page. Don, has there ever been a moment in your career where you’d have prefered to give up everything in order to do something else? I did that in 1986 when I gave up my engineering career to start writing/drawing Barks-Duck comics! Or do refer to the past 18 years of that new career? I think I’d either retire and just start selling off my comic collection for living expenses, or I might accept a long-standing offer from Bongo Comics to start doing Simpsons comics. The Bongo comics sell best in Europe, and maybe they’ll like having my name in them? Which comics, except Duck comics, are your favourite ones? Well, now, remember I am not a fan of Duck comics . I am a fan of Carl Barks’ Duck comics. Aside from Barks’ work, I like the E.C.s of 1947–56, Superman by Swan and Schaffenberger and others, Will Eisner’s Spirit, Cole’s Plastic Man, Stanley’s Little Lulu, Asterix, Prince Valiant, Flash Gordon … I could keep writing down comic titles I love as along as I sat here … There’s too many to list. Mr. Rosa, are you going to stop writing and/or drawing when you can retire (I hope not)? And if you stopped, would you like to paint Donald Duck & Co. (like Carl Barks)? Nah, I don’t think I’ll ever start painting Ducks or anything else. Even Barks was not that great a painter, but people wanted to see him paint his Ducks, the Ducks that he created and entertained the world with for decades. When he tried painting some other Duck characters, nobody was interested. My situation would be that I am neither the creator of these (Barks’) characters, nor am I as good an artist as any of these other Duck cartoonists. Somebody like Rota or Jippes or just about any of them has forgotten more about painting and cartooning than I’ll ever know. If an old Duck artist should start doing Duck paintings, it would be one of them. People like my stories, not my art! Which story that you might have had in mind for ages did you always want to put into action, but weren’t able or allowed to? The story about the search for the Nephews’ parents and/or Donald’s mother ($crooge’s sister Hortense). But I am stopping myself from being allowed to do that even if the editors didn’t. There’s just no way to explain why these characters have never been mentioned or have never been seen in Duckburg, even if they were only visiting. Plus there can be no happy ending on such stories. Why did you introduce John D. Rockerduck so carefully in chapter 4 of The Life and Times of $crooge McDuck , but then never let him appear again? Which still living Duck artist do you like best? I’d give anything to be able to draw as fabulously well as Marco Rota!!! What happened in your opinion at the White Agony Creek, when $crooge kidnapped Nelly? You wrote that you couldn’t draw that in a Disney comic. C’mon, now! You’re a big boy, right?! $crooge and Goldie alone together in a remote Yukon cabin during a long, cold and snowy winter? What do you think would happen? I’m interested in how Flintheart Glomgold earned his first Rand (which had been stolen by Magica De Spell in A little something special ). Good question. But he probably stole it. Are you going to visit Germany again for a signing tour? I would like to have an autograph or perhaps a little drawing by you. That’s probably unlikely. I always seem to be at odds with the German branch. Anyone can have my autograph on a photo anytime—all they need to do is give me their address. Or they can have me sign any quantity of comics if they just send them to me with return postage (in cash). In the story A Letter from Home we see Scrooge’s sister Matilda again – now an old woman who seems to never have been married. The theory that Ludwig von Drake is her husband is therefore no longer true. Who says she was never married? Who says she isn’t still married? Maybe Ludwig was away on a lecture tour. I just didn’t have time to deal with that matter in that already-too-long and much-too-complicated story. Plus, I am not allowed, last I heard, to use LVD in these comics … he is officially dead . But as far as I’m concerned, Matilda and LVD are married still, and he normally lives there at Castle McDuck. How did you get the idea to include the D.U.C.K. dedication in your stories? It seemed like an obvious thing I should do. The only reason I started doing these comics is due to Barks’ work—it’s all dedicated to him! And you know that I inserted that dedication from the very first story, The Son of the Sun , but it was removed by the editors. It’s been restored to where it originally appeared in the recent Hall of Fame edition as well as the American Gemstone reprint that just appeared. With the Black Knight you created your first own character. Do you already know what will happen to him in the future? And if so, do you want to integrate him into the society of Duckburg or will you leave it – for the time being – at the three stories, which he appears/will appear in? No, I didn’t even know how to use him that second time but fans seemed to like him so much that I forced myself to think up a new angle on how to use him. But now that I’ve done that, I again think that I’d never again think up a new way to use him and his Omnisolve™ suit. Maybe I would’ve thought up how to use him in some other way besides with that suit. ??? But he lives on the French Riviera, not in Duckburg. I’m very interested in the Ducks’ Family Tree. Do you plan to create a story with some characters like Fethry Duck and his brother Abner Whitewater Duck or the two characters who only appeared once, Ludwig von Drake and John D. Rockerduck, some day? No. For one thing, I don’t even really believe that Fethry exists. He’s taking up the spot on the Tree (as regards the total number of Ducks present) that I wanted LVD to occupy, or that I think LVD does occupy. Will you ever draw a $crooge comic playing between 1930 and 1947? Probably not since that $crooge would look and act pretty much the same as the modern (1950s) $crooge, only not have Donald and the Nephews as sidekicks and not even have his estranged sisters as were present in my 1906 Panama story. Actually, he might just be a very unlikable character in those years! Plus I say he was retired and totally inactive for part of that time. So, I would not have a reason to do any stories during that period. It is the use of this partly comical wit that makes your stories outstanding from the Disney bulk. It reminds me of E.C. Segar’s Popeye from the thirties – am I wrong or is there an influence on your work discernible? No, that’s one influence I can’t claim along with my many, many others. I’ve never read Segar’s Popeye work. I even bought a set of reprints from Fantagraphics Books that were published a few years back, but I’ve never had time to read ’em. Maybe that’s something I can do now! Why isn’t Ludwig von Drake used in a way that he fits into your Duck universe, as Matilda Duck’s husband? And are the rumours true that you think Daisy’s brother is the father of Huey, Dewey and Louie? As I’ve said, when I once tried to use him the Egmont editors would not allow it. I haven’t had a reason since then to see if they’ve changed their mind … but it’s still the same editor and he never changes his mind about stuff. I don’t know, but that’s an interesting situation that could be possible. Why not? It explains why the Nephews refer to Daisy as Aunt Daisy in the old American editions, though the real reason is just that there’s no other way to have those kids refer to her. Maybe as Miss Daisy ? We had a lot of questions about HDL’s parents. What’s exactly the matter with them? Will you ever write a story about whatever happened to them (maybe not for Egmont but for Disney Hachette Presse, for example)? And – some quite similar questions – regarding the fate of Donald’s mother Hortense … Why is she considered as being dead although characters in Disney comics usually never die? Most people don’t live together with their parents. So, why should she be around all the time? She could have visited Donald without this being shown in an own comic story (Donald knew, for example, that Mathilda lived in Castle McDuck though there never was a story telling how he got to know it). I don’t know about anybody else’s Disney comics, but people die in my comics and I always had the sense that people died in the Barks comics I grew up with. No, she couldn’t! If Donald’s mother were alive and visiting him, it would have been shown at least once in the last 60+ years of Donald Duck comic book stories! Otherwise the comics would have been unfairly tricky and misleading to the readers for all those decades! But Matilda is not as important a character to the Duckburg Ducks as their mothers are. Matilda was only an aunt. And she was staying away for a good reason as I did try to explain in the Lo$ episode 11 … and I was glad to finally bring that hanging plot thread to a close in that Letter from Home tale, though I sure wish I coulda done it with a bit more humor and action. Thanks again to Don Rosa for his kind participation in this project.